At age 2, (1942) I was placed in a state-run orphanage in Amsterdam, Holland after the Nazis dragged my family away in front of me at the dining room table. Suffering malnutrition and horrific abuse daily. I had two options; suicide or run away. I chose to run away from the orphanage at age 9 and “somehow survived’ on the streets of Amsterdam on my own. A few years later I met an American family that were so taken and moved by my story that they arranged a green card for me and I came to America in 1964. My dream had finally come through. 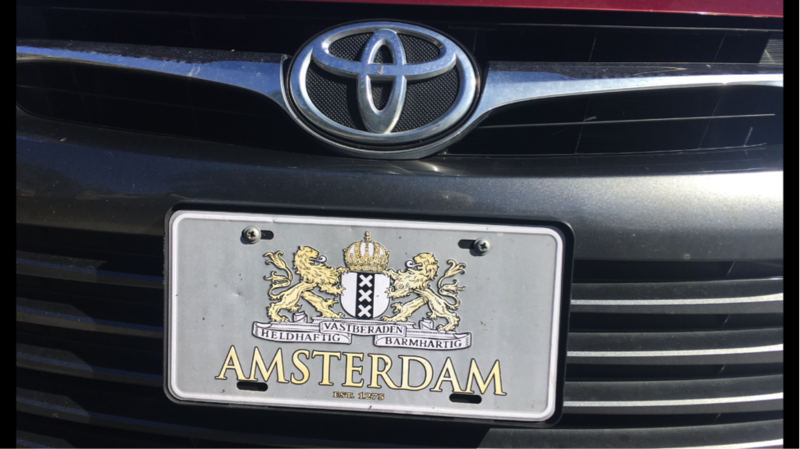 In order not to ever forget the misery, I created a license plate seen below so I can see every time I get into my car, where I am from and reminding me what happened during those horrible years. The anguish of a malnourished mind and body took its toll so when I arrived in America as a young man, I was in bad shape, even suicidal. I took handfuls of vitamin pills that didn’t help me That led me on a lifelong journey of studying everything I could find on nutrition, and ultimately, I discovered that a liquid vitamin would increase absorption dramatically resulting in greater results. 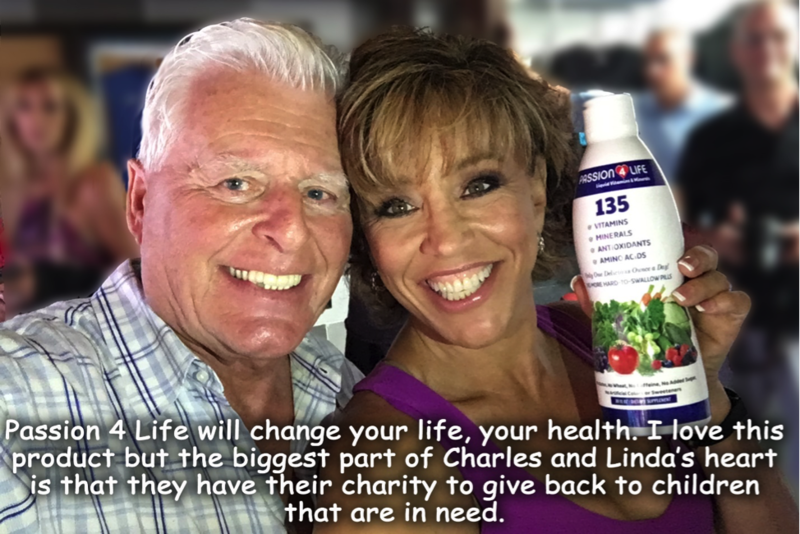 Since I couldn’t find a liquid multi-vitamin product in 1965, I decided to create it, and so many years later after all the research Passion 4 Life was born. My wife named it after the way I live my life. I created it for me as I needed to change my life. After Passion 4 Life worked so well for me, I decided to share it with the world. 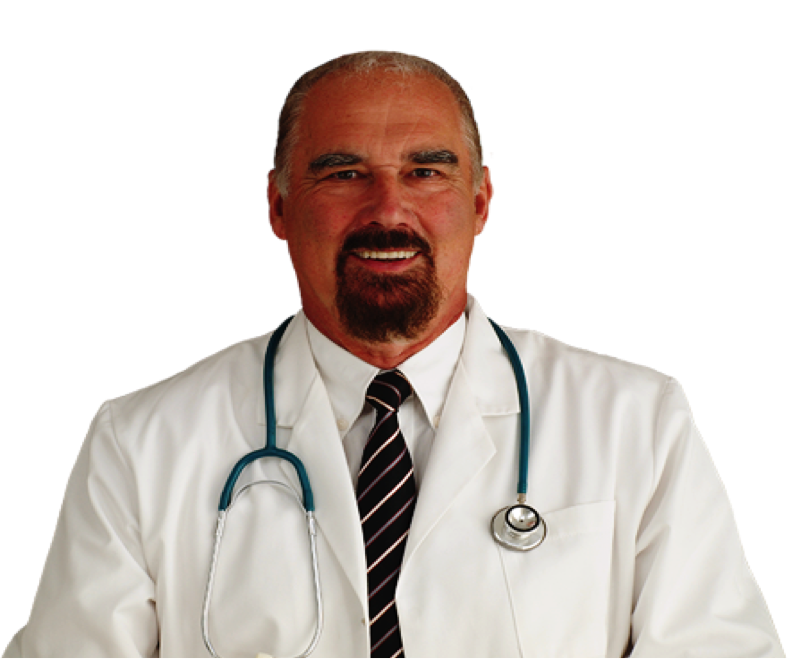 Passion 4 Life is backed by 15 years of research with many unpaid for testimonials and endorsements from doctors, professional athletes, celebrities, PhDs, researchers and ordinary people thanking me for helping improve the quality of their lives. Simply, because it works! I want to help educate people on the role that vitamins and minerals play in your life. It’s much greater than most people ever imagine. We’re talking about the effect stress and depression can have on all of us. Independent clinical tests using liquid vitamins and minerals have shown reductions in depression and reduction in mind chatter that generate confusion, frustration and feelings of stress. Participants in this double-blind controlled study by independent doctors conducted in March of 2006 revealed improvements as follows: improved focus and greater energy, stamina, ability to sleep all night and the ability to wake feeling refreshed in the morning. It has been my life’s mission to turn my tragic beginning in life into a story of reinvention and hope by combining the 2 things I lacked in life – good nutrition and someone to care as a portion of the vitamin profits helps fund our non-profit children’s charity, Passion 4 K.I.D.S. We are a “Vitamin with a Mission”. When you do something good for your own health, you also help a US child in need. We are a family-run company whose core values are integrity, quality and the highest possible customer service. My wife, Linda, is our CEO. Her background working in the White House for President Ford and working with Billy Graham for more than 20 years makes her very smart and a PR dream. She also runs our non-profit kids charity and is great at it. We work hands on daily with the children we are honored to serve. We are just two ordinary people trying to do extraordinary things with God’s help. We want to encourage others to move out of their comfort zone and take a step of faith to help change the world. We have been honored by proclamations from Senator Darryl Issa from the US Congress, the California Legislature and the San Diego County Board of Supervisors, all of which can be seen on www.passion4kids.org under MEDIA. Just recently we were given the California Hero Award by the California Senate. Passion 4 Life will work for you, guaranteed! We have a 30-day money back guarantee without any questions. 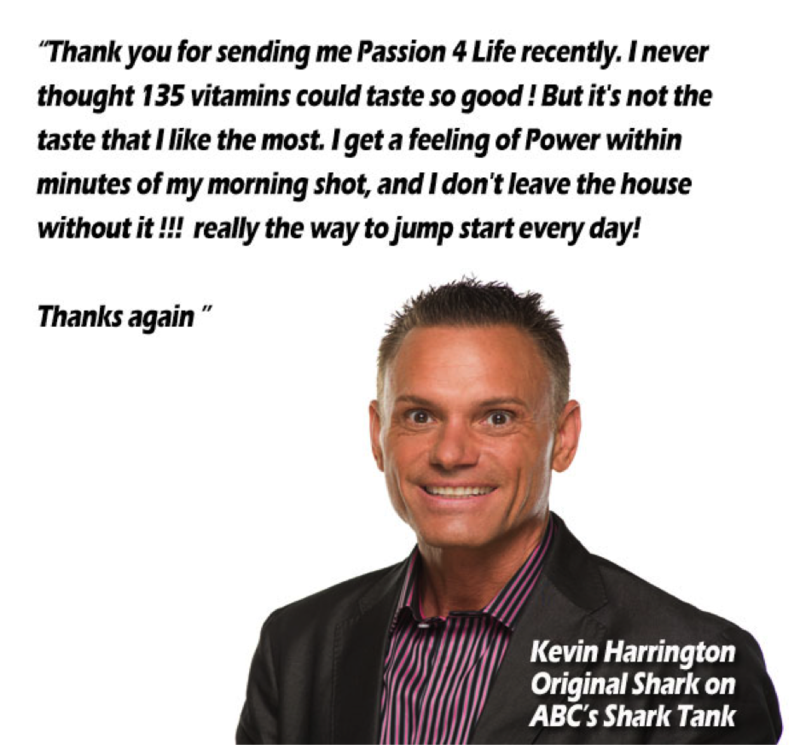 Passion 4 Life is a 135 whole food based liquid product with an absorption of up to 98% within 3 minutes of ingestion whereas most hard-to-swallow pills only absorb between 10 and 20 percent. Why would anyone waste up to 80% of your hard-earned dollars you spend on vitamin pills? It doesn’t make any “cents’. Passion 4 Life is 5-6 times more effective than pills! God didn’t design our stomachs to digest ‘rocks”. It will give you more energy, more focus and a better memory. It will dramatically strengthen your immune system. Remember, a weak immune system is where most health problems start. It will slow down your aging process and make you feel better! This is how to protect your immune system! Passion 4 Life every day! The modern diet is depleted of many if not most vitamins, minerals and antioxidants and other nutritious factors that are essential to your body and your mind. A scientist in front of a Congressional Hearing in 1965 stated “A bunch of carrots grown in today’s soil, will have the nutritional value of a toothpick!” That says it all and that was more than 50 years ago. Our bodies have to deal with a greater “toxic load” than ever before. People are more stressed than ever before. Our repair mechanisms and immune systems are in a worse condition than ever. It is imperative to take every day one ounce of an effective and powerful liquid vitamin and mineral product. Such is Passion 4 Life, proven over the last 10 years to change people’s lives and give us more energy, less aches and pains and slows down the aging process. That’s how you strengthen your immune system! My desire is to leave a legacy of hope and that no matter how you start in life, you can turn it around and make a positive difference for yourself and for the world. So, take your “Passion” and make it happen. She sold more than One Billion dollars of products and services on HSN! She LOVES Passion 4 Life! No more hard-to-swallow vitamin pills! All ingredients shown below are in Passion 4 Life and deal with people’s physical problems. Now Take Your Passion and Make it Happen!